The spa-like oasis has some impressive amenities, including a sauna, a walk-in closet that doubles as a bar, a swimming pool and an outdoor kitchen. Is this a house or a luxury resort? 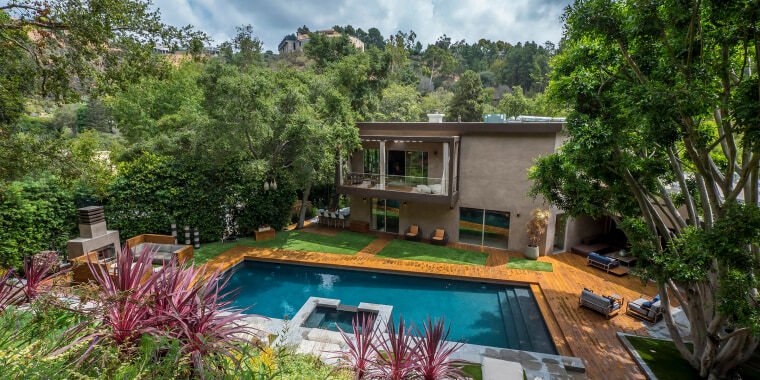 Comedian and former late-night talk show host Chelsea Handler just put her Los Angeles, California, house on the market, and we’re swooning over the luxury features the 5,572-square-foot property boasts. The six-bedroom, seven-bathroom home has plenty of space for guests to stay, and they’ll certainly feel like they’re at a fancy resort with all the amenities it offers. Gorgeous floor-to-ceiling glass doors stream light into the open living space and disappear when opened to create an indoor-outdoor experience. Dinner alfresco, anyone? In the fully equipped chef’s kitchen, you’ll find glossy white cabinets, matte black countertops, Viking appliances and a large island/breakfast bar. A row of windows above the sink area provides a view of the treetops, making you feel as if you’re in your very own treehouse. More natural light streams in through the massive skylight above. The master suite features a private balcony and a drop-down TV. Extras aren't spared in the master bathroom, either. There's a soaking tub, double vanity and even a sauna. We're not surprised that Handler once told People that it was her favorite part of the space. “If you have a bar in your bedroom, it feels like things are going your way,” she said. Outside the house is equally impressive. A family game room opens up to a 50-foot-long pool, and there are plenty of patios and decks. There's also an outdoor kitchen and pizza oven. Handler is asking $11.5 million for the property. Hey, at least we can dream. See more pictures of this retreat here.